I've tested this with Windows XP Pro SP2 - but it should also work with other Windows versions. Right click on "My Computer" and select "Properties"
Switch to the tab "Computer Name" and click on "Change"
A few moments later you'll be asked for a username and password. Use the domain administrator account that you created at step 5.2 (e.g. : Username "Administrator" with the password "howtoforge") and click on "OK"
When the system is up again, log in with the domain administrator account that you created at step 5.2 (e.g. : Username "Administrator" with the password "howtoforge"). Be sure that you select the domain from the drop down menu! Click on "Start" and afterwards on "execute". Enter "gpedit.msc" and click on "OK". 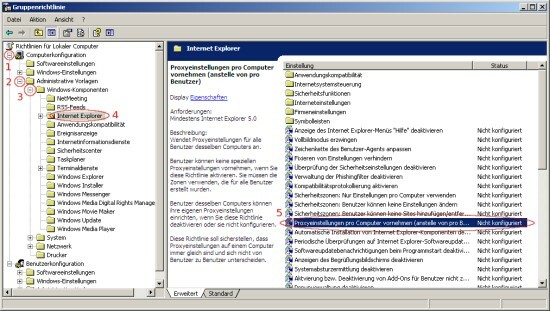 Browse to the Internet Explorer settings and activate "proxy settings per computer." 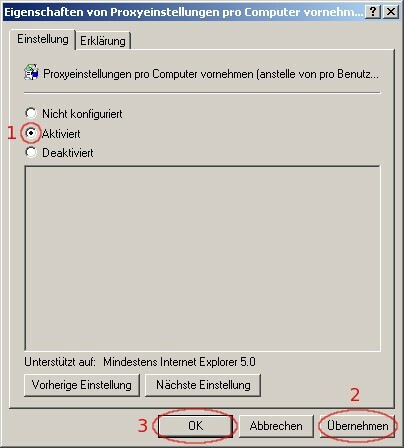 Now open the Internet Explorer, click on "Extras" and afterwards on "Internet Options". Edit the proxy settings as shown on the screenshot below. Log out and in again with the domain user account that you configured at step 19.4 (e.g. : Username "olli" with the password "howtoforge"). Be sure that you select the domain from the drop down menu! Domain users won't be able to change the proxy settings.